Empathy. It is a little word that has a lot of power. And in the wake of all the tragedies our country is dealing with, we are reminded of its power. Some people react to tragedy by lashing out, others by taking to social media to use the situation as proof of their opinions, and still others by withdrawing or ignoring the situation. Those who are most effective during times of tragedy are those who listen. 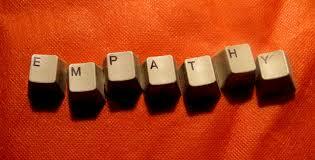 They respond with empathy, rather than reacting in anger. They are careful to focus first on the people – all people – who have been impacted and what they need, rather than to point fingers and assign blame. In a time when our world is experiencing an astonishing number of violent acts and tragic events, we must ask ourselves, “What does the world need from me?” Does it need me to lash out or does it need me to be kind? Does it need me to react in anger or does it need me to respond with openness? As leaders, we should know the right answers to those questions because we practice being intentional every day. Whether during a national tragedy or a challenge or crisis at work, remember the power of empathy. Be curious, open, and generous. Respond rather than react. Remember that your words and actions have an impact and choose them carefully. If you do that, you will create opportunities to lead change, and change leadership.